This is the adventure of two guys (with the help of a girl, too) as they attempt to build the ultimate modular tabletop gaming table. 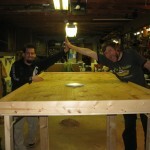 We decided to build our own table from scratch to fit the design we wanted. The basic idea was to create a lipped table with various size terrain blocks so that we could mix and match them for different terrain configurations. This is a work in progress. The table is (mostly) done, but the terrain is just being started. We started with a basic folding table design. The sides were to fold up, and the legs were to fold under. Powered by WordPress v 5.1.1. Page in 3.386 seconds.